Adults Preheat conventional oven to 375˚F. Kids Be sure to wash hands. Cooking can be messy work. You might want to wear a smock or apron. Line cupcake pan with 8 baking liners (not included). Kids Combine cupcake mix, butter, water and egg* in mixing bowl. Beat until well blended. Adults Divide batter evenly into 3 bowls and add up to half of the contents of one color powder pouch to each, stirring well to combine, until desired color is achieved. HINT: To achieve the look on our box, use 1/8 tsp. pink color powder, ¼ tsp. purple color powder, and half of the green color powder. Reserve remaining color powders for frosting. Kids Working with one color at a time, use a teaspoon or a small muffin scoop to distribute a little bit of batter among the 8 baking liners. HINT: Place the batter in one section of the baking liner and the next color next to it. Rotate colors in this fashion until all cupcake batter has been distributed evenly among the liners. 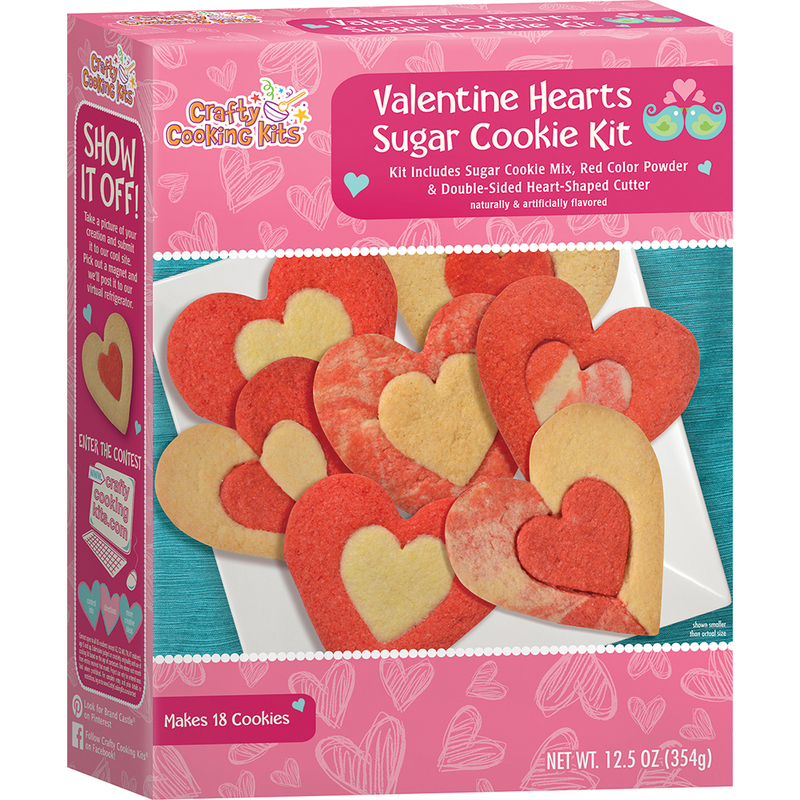 Adults Bake for 14 to 16 minutes or until toothpick inserted into center comes out clean. Adults Remove cupcakes from oven and cool completely on cooling rack. Kids Assemble aprons by interlocking ends and place one cupcake in each. Kids Beat room temperature butter with mixer on HIGH until light and fluffy, about 1 minute. Add frosting mix and powdered sugar; beat on LOW until combined. Add milk and beat on HIGH until creamy. Adults Divide frosting evenly into 3 bowls. Working with one bowl at a time, add a small amount of remaining color powder, stirring well to combine, until desired color is achieved. Insert one of the small piping bags into a tall glass and pull edges over rim of glass to hold bag open. Use a spatula to fill with the green frosting. Cut 3/4 inch off the tip, twist the top of the piping bag to close, and gently squeeze frosting to the tip of the bag. Set aside, and repeat process with the pink frosting and second small piping bag. Stand the large piping bag in the glass and pull edges over rim of glass to hold bag open. Squeeze the pink frosting along the left seam of the open piping bag starting at the bottom working outward. Repeat the process with the green frosting, squeezing along the seam on the opposite side of the bag. Now, use a spoon and plop the purple frosting right into the middle of the piping bag. Twist the bag to close and cut a 3/4-inch tip. Kids Squeeze frosting onto your cupcakes in a circular motion. 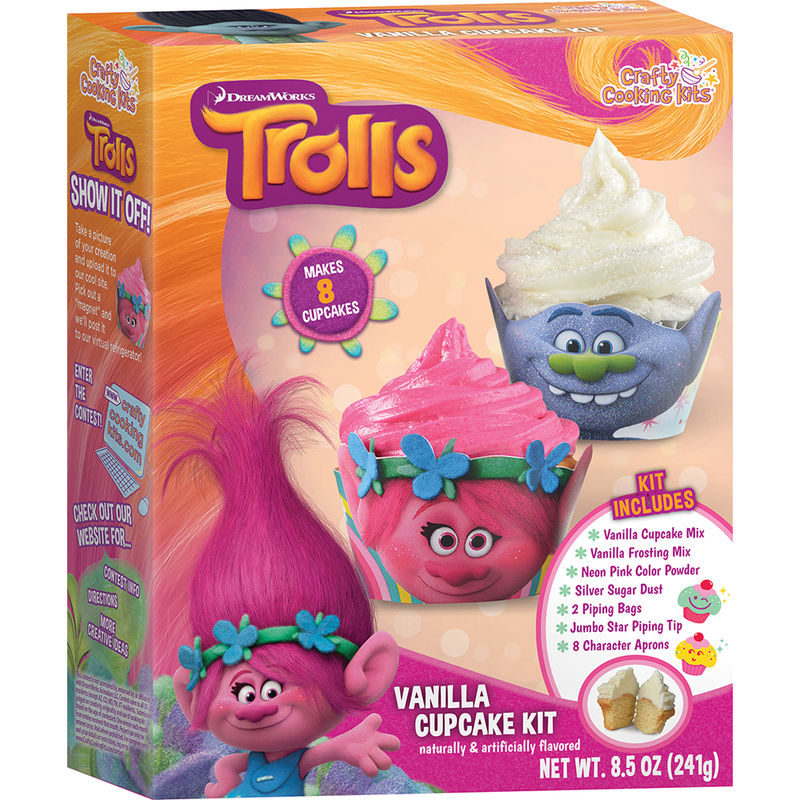 The frostings will mix and combine to create a unique tie-dyed affect; each cupcake will be different! 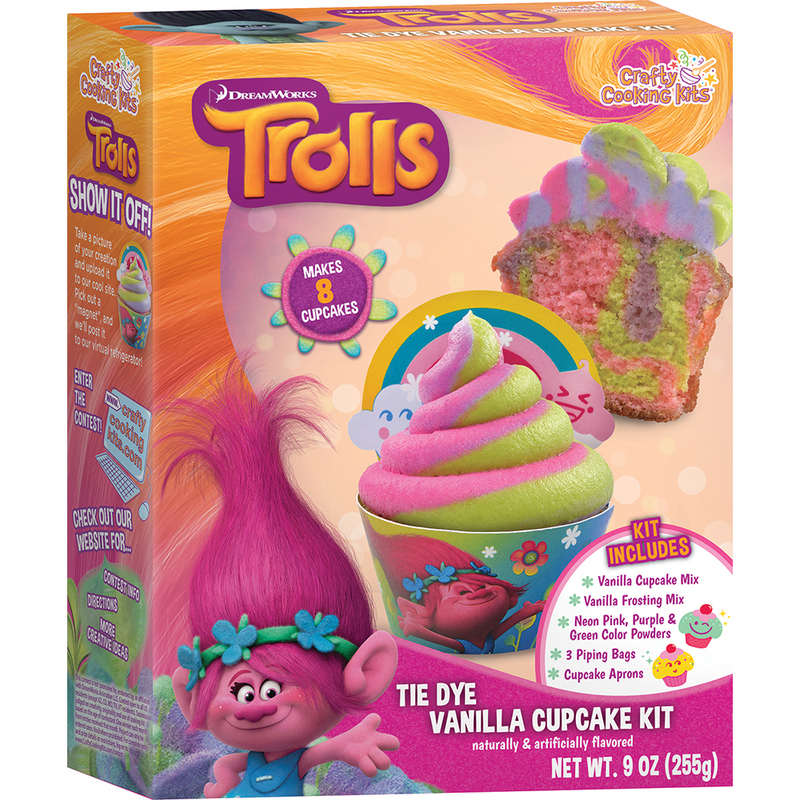 Place your Trolls Tie Dye Vanilla Cupcakes on a serving platter and enjoy! *High Altitude (over 3500 ft.): Add 1/3 cup flour to mix; decrease water to 3 TBSP. Mix only until well-blended. Bake 375˚F 14 to 16 minutes. Makes 9. Kids Combine cupcake mix, butter, water and egg* in mixing bowl. Beat until well blended. Distribute cupcake batter evenly, using a spatula to scrape all mix from bowl. Kids Assemble aprons by interlocking ends and place one cupcake in each. Empty decorative sugar into a small bowl and set aside. Adults Beat butter on HIGH until light and fluffy, about 1 minute. Add frosting mix and powdered sugar and beat on LOW just until combined. Add milk and beat on HIGH until creamy. Divide frosting evenly into two bowls and add contents of pink color powder to one of them, mixing well until evenly blended. Set aside. Cut 1 1/2 inches off the tip of one of the piping bags. Drop decorating tip into the bag and push down firmly (half of tip should be exposed). To fill, insert bag into a tall glass and pull edges over rim of the glass to hold bag open. Use a spatula to fill with white frosting. Twist top of bag to secure. Kids Gently squeeze frosting to tip of piping bag and pipe a swirl of frosting on the four cupcakes in the Guy Diamond liners. Immediately sprinkle each cupcake with a bit of silver sugar. Adult Cut the piping bag near the tip to release it and wash the tip with warm water. Prepare second piping bag in the same manner as above and fill with pink frosting. Kids Gently squeeze frosting to tip of piping bag and pipe a swirl of frosting on the four cupcakes in the Poppy liners. Transfer cupcakes to a serving platter and enjoy! 1. Preheat oven to 350°F. Wash cutter with warm soapy water and dry thoroughly. Lightly grease baking sheet. 2. Combine cookie mix, room temperature butter, and egg*. Mix until well blended. 3. Place dough on a lightly floured surface and turn to coat both sides. Roll cookie dough to 3/16 inch thick or desired thickness. Cut sweater shapes with included cutter, rerolling dough as needed. HINT: If dough becomes sticky, place in fridge for 10 minutes and flour rolling pin and dough liberally. 4. Place cookies 2 inches apart on baking sheet. 5. Bake for 10 to 13 minutes or until edges are golden. HINT: Thicker cookies will need longer to bake while thinner cookies will bake more quickly. 6. Remove from oven and let cookies cool on baking sheet for 1 minute. Transfer to rack to cool completely. 1. For red frosting, use an electric mixer to beat room temperature butter on HIGH for one minute, or until light and fluffy. 2. Add frosting mix and powdered sugar and beat until combined. 3. Add milk and beat frosting on HIGH for 1 minute until creamy. 4. Insert piping bag into a tall glass and drape over the edge of the glass to hold it open. Use a spatula to fill with frosting. Twist top of bag to secure. Repeat process to make green frosting. 1. Empty all candies into small bowls. 2. 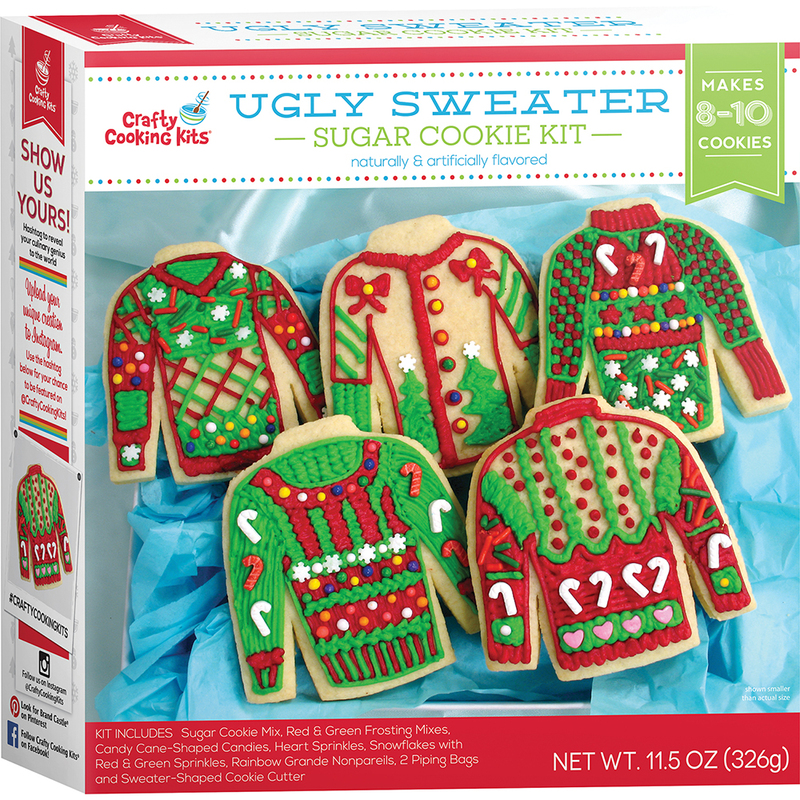 Cut small tips off of each piping bag and decorate Ugly Sweaters with lace, beading, stripes and other fun designs. HINT: Squeeze a dime-sized dollop of frosting onto cookie and spread using a small offset spatula or knife. Accent cookies with candies and sprinkles. Refer to box for inspiration. 3. Place your Ugly Sweaters on a serving platter and enjoy! * High Altitude (over 3500 ft.): Add 3 TBSP. flour and 2 TBSP. water to mix. Mix as directed. Place dough in refrigerator for 10 minutes before beginning rolling process. 3. Place dough on a lightly floured surface and turn to coat both sides. Roll cookie dough to 3/16-inch thick. Cut sweater shapes with included cutter, rerolling dough as needed. HINT: If dough becomes sticky, place in fridge for 10 minutes and flour rolling pin and dough liberally. 4. Place cookies 2 inches apart on baking sheet. Bake for 10 to 13 minutes or until edges are golden. HINT: Thicker cookies will need longer to bake while thinner cookies will get done faster. 5. Remove from oven and let cookies cool on baking sheet for 1 minute. Transfer to rack to cool completely. 1. Use an electric mixer to beat room temperature butter on HIGH for one minute, or until light and fluffy. Add frosting mix and powdered sugar and beat until combined. Add milk and beat frosting on HIGH for 1 minute until creamy. 2. Insert one of the piping bags into a glass and pull edges over rim of glass to hold bag open. Use a spatula to fill with 1/3 of the frosting. Twist top of the piping bag to close, cut a small tip, and set aside. HINT: Start with a small tip for detailing. You can always make it larger. 3. Divide remaining frosting in half and place in mixing bowls. Empty contents of one color powder packet into each bowl and mix until color is evenly distributed and bright. Twist top of each piping bag to close, cut a small tip, and set aside. Empty sprinkles into a small bowl. Embellish Hanukkah Ugly Sweaters with menorahs, dreidels and other fun designs. HINT: To cover large areas more quickly, squeeze a dime-sized dollop of frosting onto cookie and spread using a small offset spatula or knife. Accent cookies with sprinkles. 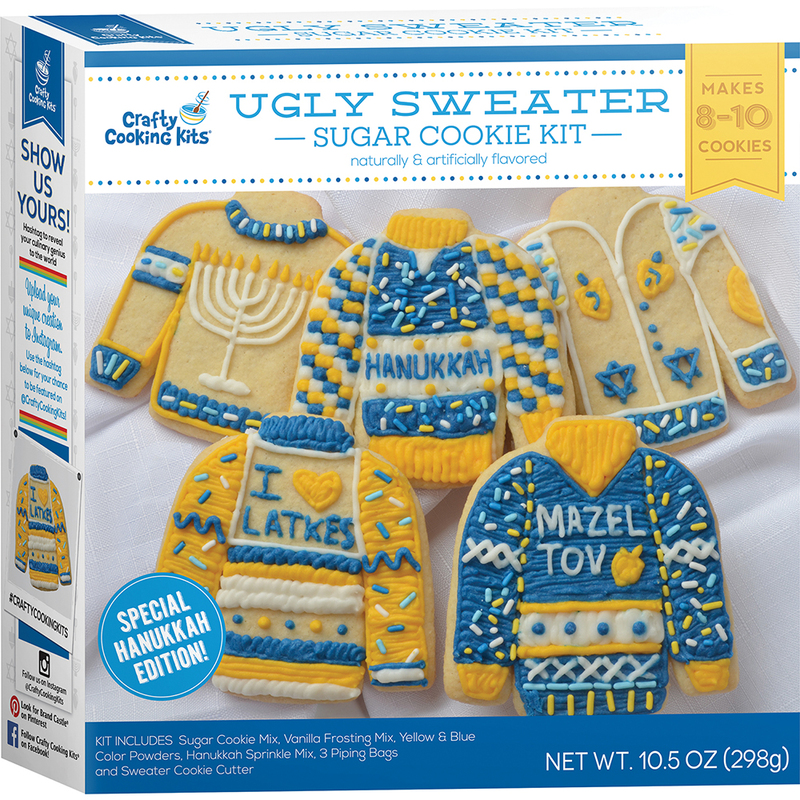 Place your Hanukkah Ugly Sweaters on a serving platter and enjoy a festive treat! 1. Preheat oven to 350°F. Lightly grease a baking sheet Wash cutters in warm, soapy water and dry thoroughly. 2. Combine cookie mix, room temperature butter, honey and water*. Mix until well-blended, 2 to 3 minutes, dough takes some time to come together. Allow to rest in refrigerator for 30 minutes. 3. On a lightly floured surface, roll cookie dough to 3/16-inch thick or desired thickness. Cut into shapes with cutters, rerolling as necessary. Place 2 inches apart on prepared baking sheet. 4. Bake for 9 to 11 minutes or until golden. HINT: Larger, thicker cookies will need longer to bake while smaller, thinner cookies will bake faster. 1. Dissolve icing mix and water in a mixing bowl. Add powdered sugar and mix with a fork until smooth. 2. Spoon icing into piping bag. HINT: Drape edges of bag over a glass to make filling easier. 1. Cut a small tip off of the piping bag and each icing pen and pipe details onto Walking Gingerdead Cookies. 2. Empty candy beads into a small ramekin. Secure to cookies with icing. 3. Icing will harden in 30 minutes and dry completely in 45 minutes. Place on serving platter and enjoy! 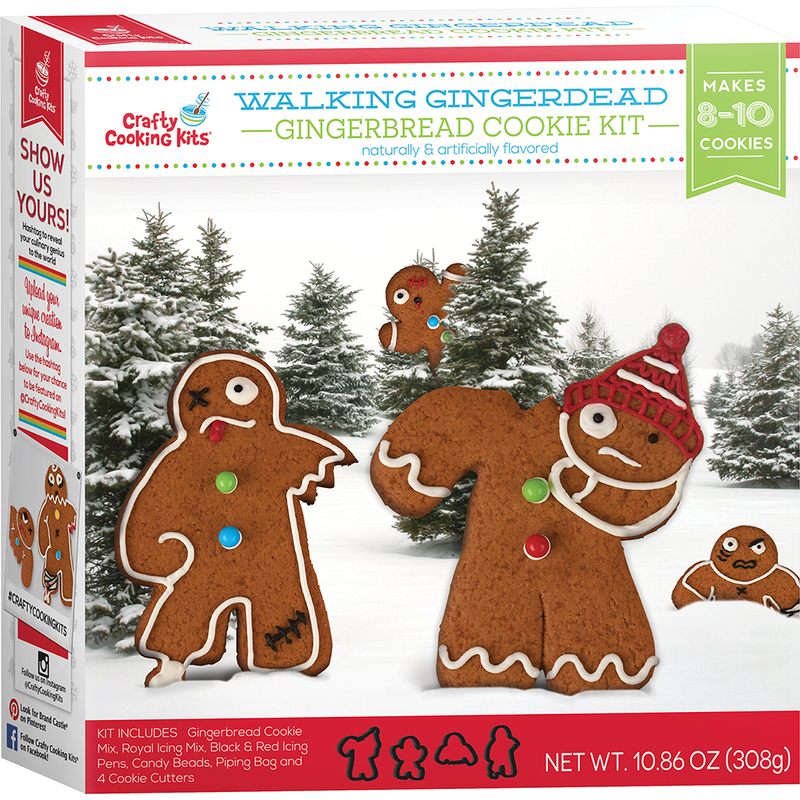 Fight the urge to save your Walking Gingerdead Cookies. These undead are best eaten the same day. *High Altitude (over 3500 ft): Add 2 TBSP flour to mix; increase water to 1/4 cup. Adults Preheat oven to 375˚F. Line 8 muffin cups with baking liners (not included). Kids Combine cupcake mix, butter, water and egg* in mixing bowl. Mix until well blended. Distribute batter evenly between muffin cups. Use a spatula to scrape all mix from bowl. Adults Bake for 16 to 18 minutes or until toothpick inserted in center comes out clean. Remove cupcakes from oven and cool completely on cooling rack. Kids Assemble aprons by interlocking ends and sit one cupcake in each apron. Empty sanding sugar into a small bowl. Adults Beat room temperature butter on HIGH until light and fluffy, about 1 minute. Add frosting mix and powdered sugar and beat on LOW just until combined. Add milk and beat on HIGH until creamy. Kids Use a butter knife or small spatula to frost cupcakes and add sparkle with the sugar. Place a pick** in each cupcake. (See box for inspiration). 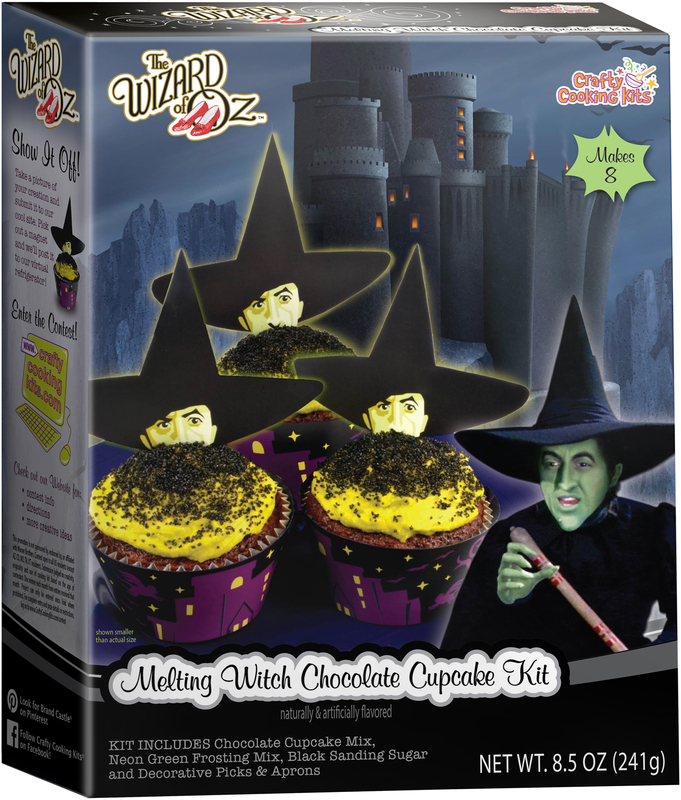 Transfer Melty Witch Cupcakes to a serving platter and enjoy! High Altitude (over 3500 ft.): Add 3 TBSP. flour to mix, bake at 375˚F for 14 to 17 minutes. Makes 9 cupcakes. 1. Preheat oven to 350°F. Lightly grease baking sheet. Wash cutters with warm soapy water and dry thoroughly. 2. Combine cookie mix, room temperature butter and egg*. Mix until well blended. Gather dough into a ball and make a well in the center. Empty contents of green color powder pouch into well and use hands to knead color evenly into dough. 3. Place dough on a lightly floured surface and turn to coat both sides. Roll out to 3/16-inch thick. Cut zombie shapes with included cutters, gathering and rerolling dough as needed. HINT: If dough becomes sticky, place in refrigerator for 10 minutes and flour rolling pin and dough liberally. 4. Place cookies 2 inches apart on baking sheet. Bake for 10 to 13 minutes or until edges are golden. 2. Insert piping bag into a tall glass and drape over the edge of the glass to hold it open. Use a spatula to fill with frosting. Twist top of bag to secure. Insert piping bag into a tall glass and drape over the edge of the glass to hold it open. Use a spatula to fill with frosting. Twist top of bag to secure. 1. 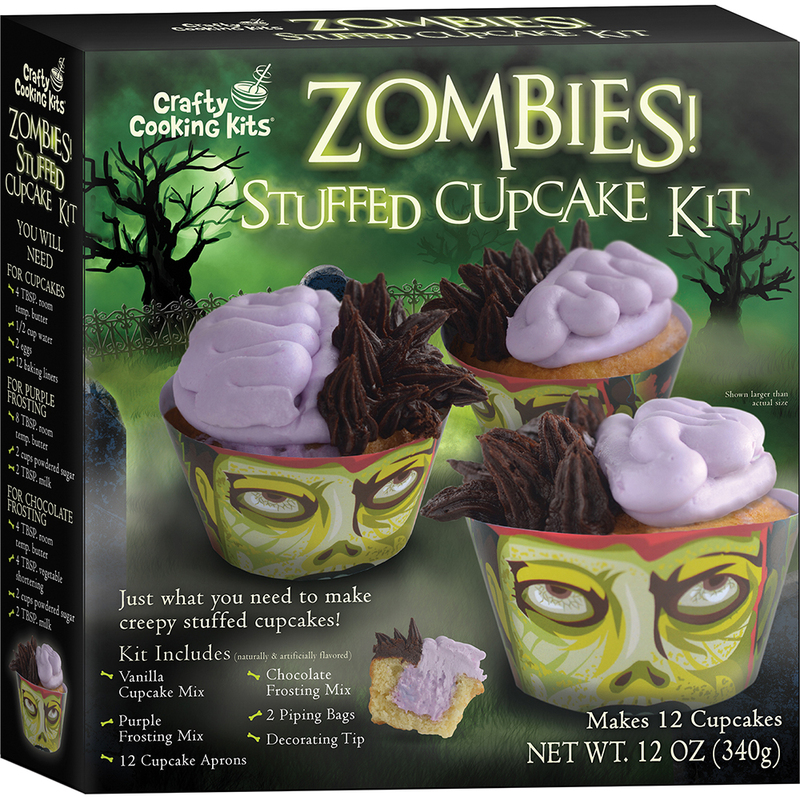 Cut small tips off of the piping bag and each icing pen and decorate Zombie Cookies with ripped clothing, snarly faces and other ghastly details. HINT: To cover a larger area, squeeze a dime-sized dollop of white frosting onto cookie and spread using a small offset spatula or knife. Let set before adding contrasting details on top. 2. 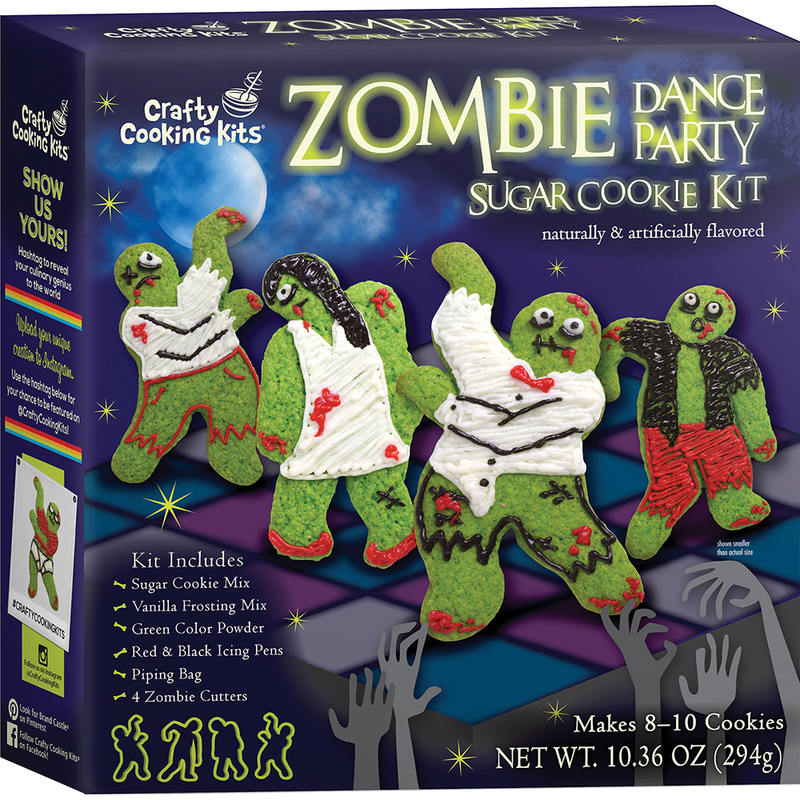 Arrange your Zombie Cookies on a serving platter and let the party begin! 1. Preheat oven to 375°F. Line 12 muffin cups with baking liners (not included). 2. Using an electric mixer, combine cupcake mix, water, butter, and eggs* in mixing bowl. Mix until well combined. Distribute batter evenly between 12 muffin cups. 3. Bake for 16 to 18 minutes or until toothpick inserted in center comes out clean. Cool cupcakes completely before frosting. 4. Drape one of the piping bags over edges of a glass to make filling easier and use a spatula to fill with frosting. Cut 3/4 inch off the tip of the bag, twist the top of the piping bag to close, and set aside. 1. Follow steps 1-3 above, adding vegetable shortening with the butter. 2. Cut 1 1/2 inches off the tip of the second piping bag. Drop decorating tip into bag and push down firmly (half of tip should be exposed). Insert bag into a tall glass and pull down over the edge of the glass to hold it open. Use a spatula to fill with frosting. Twist top of bag to secure and set aside. 1. Once cupcakes have cooled, use a cereal spoon to hollow out each one: Insert the spoon at a slight angle 1/4-inch from the edge of the cupcake and gently cut a circle. Use the spoon to hollow out approximately 2/3 of each cupcake and discard cake. Be sure not to cut through the bottom of the cupcake. 2. Assemble aprons by interlocking ends and sit one cupcake in each apron. 3. Gently squeeze purple frosting into the center of each cupcake. Create a partial brain by piping a D-shaped ring of frosting on each cupcake (fig.1). Next zig zag left to right, starting from the front moving to the back (fig.2). 4. Create tufts of hair by gently squeezing the piping bag containing the chocolate frosting onto a cupcake and releasing when the “hair” is long enough for your liking. (fig.3). Cover half of each cupcake. Place Zombie Cupcakes on a serving platter and share the scare. *High Altitude (over 3500 ft): Add ½ cup flour to mix; decrease water to 1/3 cup. Mix only until well-blended. Makes 15.